Please make note of the mailbox bracket above. This is a particular design we started seeing as soon as we got into Wisconsin and we’ve only seen this in Wisconsin. Note the angled pivot point on the right-hand side of the photo. This is genius! If anything were to strike this mailbox it pivots with the blow! Not only that, but after pivoting, because of the angle of the pivot point, it will return to center automatically. Brilliant! Now because kids everywhere like to play “Mailbox Baseball” and hit mailboxes with a bat as they careen by in the bed of a pick-up, I’m not sure this is much of a defense against a particularly heavy Louisville Slugger. 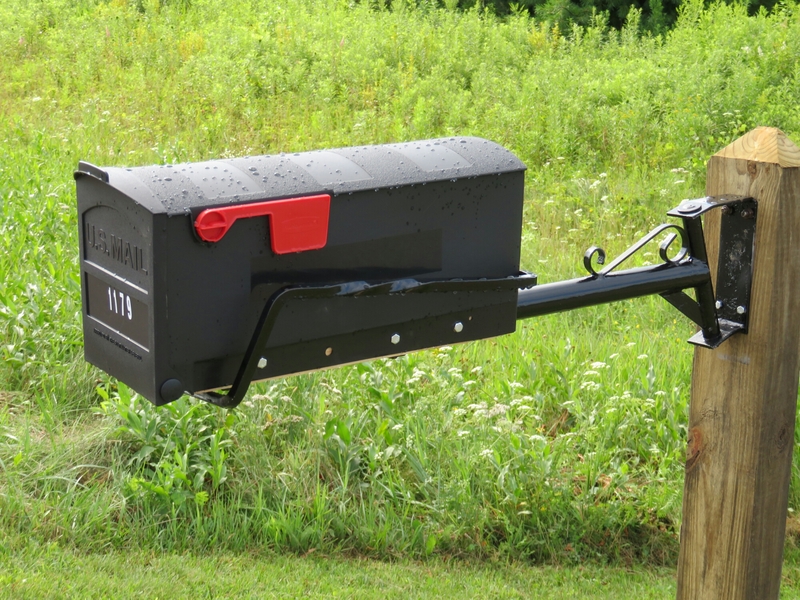 However…this being Wisconsin, maybe such a device could very well preserve a mailbox when struck by an outside rear-view mirror when a participant of a meat raffle who may have consumed too many Leinenkugels (Wisconsin beer) cannot stay between the lines on the roadway. Now, the Northwoods folk may say those mailboxes are like that because they get hit by errant snowplows, but keep in mind Wisconsin remains the only state in the nation that first offense Operating Under the Influence (OWI as it is referred to here) is not a criminal charge. I’m in my tent and it is 11:00am. This is a first. Of all the days Sallie and I have touring, this is the first day ever we’ve been confined to tents due to rain. It’s a soaker outside and it keeps stopping only to start again. I do have friends here though. 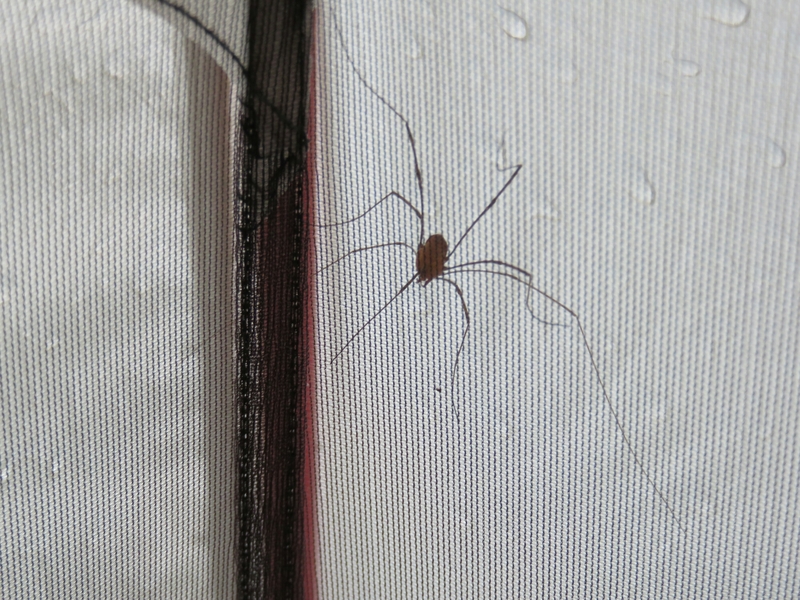 Three daddy long legs have arranged ambush sites for insects to eat in a target-rich environment. The mosquitoes found us three days ago and they won’t let go. Word is out. Sallie is reminded of the day in REI when her eye fell onto a one-person tent. It looked light, small, and compact. It was cute. I had her sit in it. Then suggested to her that it is raining outside, you have to be in there all day. She caught on. 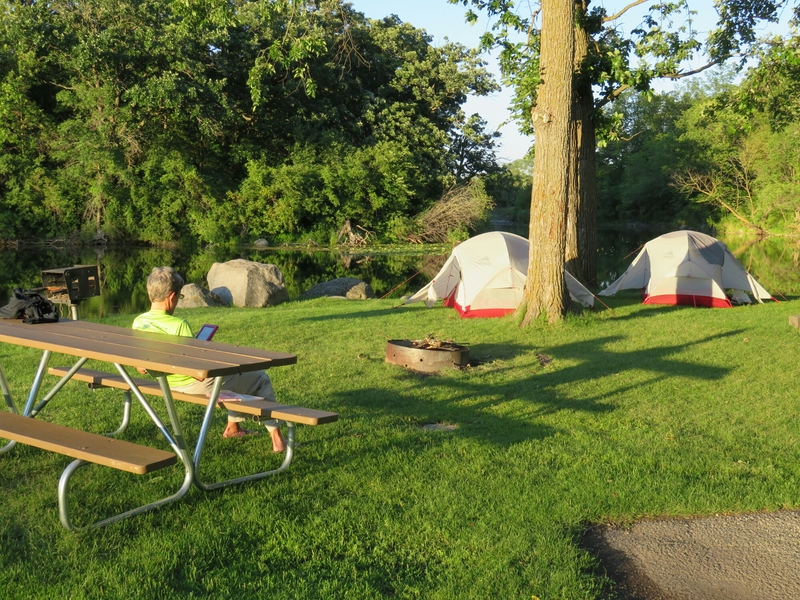 We each have roomy (but light) two-person tents. We are in North Central Wisconsin. 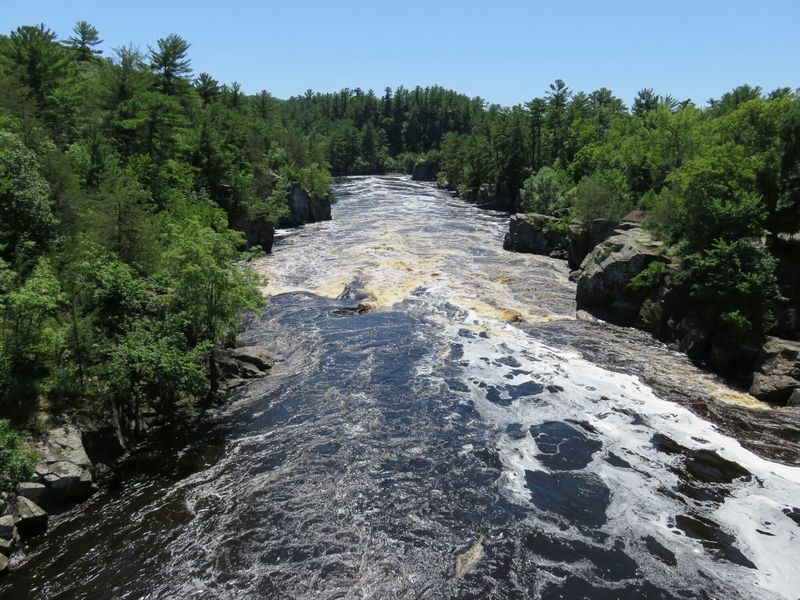 An area the locals call the Northwoods (all one word). Or they just refer to it as “Up North”. The riding is generally excellent with nice rolling terrain mainly through forests without too much active farmland. We have a guide. Peter is a retired sixteen-year member of the Wisconsin State Assembly, who lives in Madison, WI. 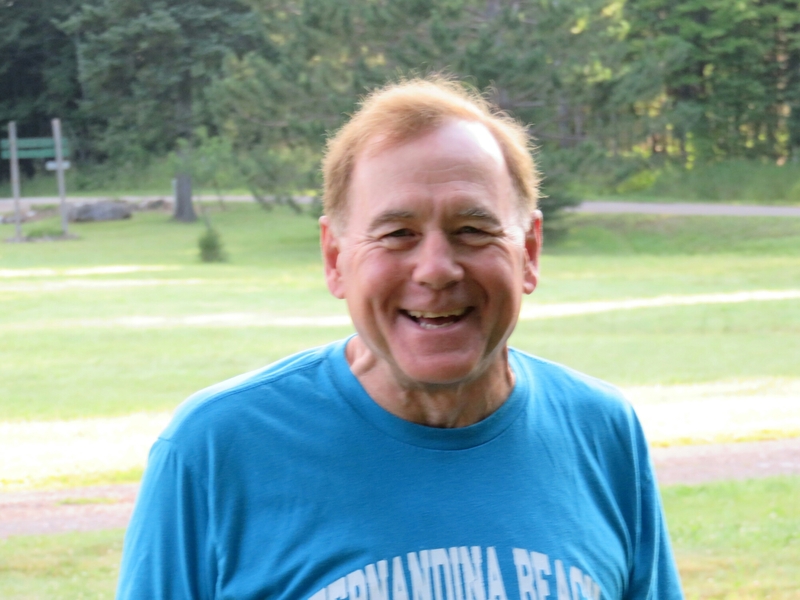 Most importantly, Peter is a part-time winter resident of Florida and a fellow member of the North Florida Bicycle Club. Peter rides his bike every day and is well known on the island on which we live. Peter has been communicating with Sallie and arranged to come up north to ride with us arriving on the evening of the 25th in order to take us out to dinner. The next day, he met us on the road for Second Breakfast (!) 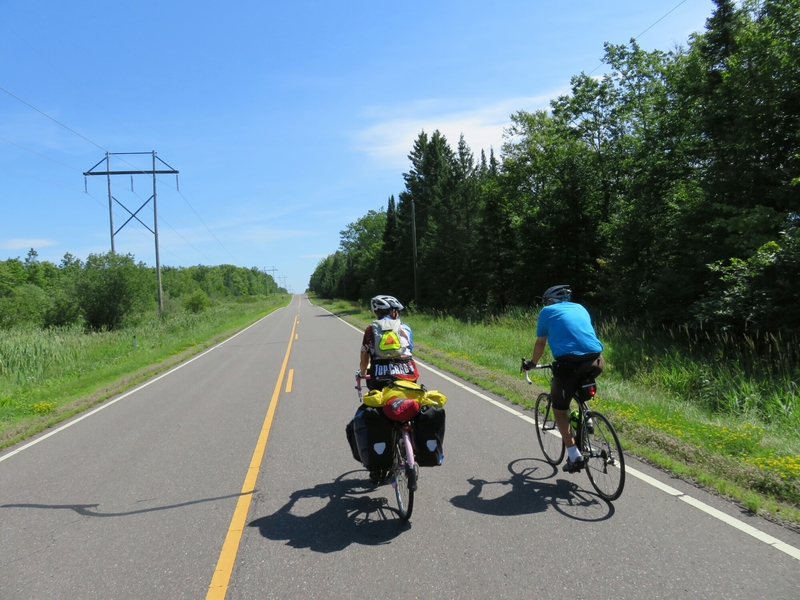 and pedaled with us for nearly 40 miles as we made our way from Butternut to Mercer along several lakes and waterways including just north of the Turtle Flambeau Flowage. Peter kept us informed about the land we were riding through as we kept looking for an open restaurant so we’d have a stopping point and he could turn around and go back to his car. Since we were “Up North”, there were a number of restaurants, but most were closed. Because we were in the Northwoods (or Wisconsin in general) there were quite a few taverns as well, but as with the restaurant’s, times are a little harder up here and they were closed as well. Finally, we made our way in to Mercer and we had a stopping point. Peter joined us for a milkshake as we ordered lunch and then took his leave, but not before sharing with us some secret phrases that are guaranteed to keep us out of any jam should we have difficulty in Wisconsin. I shall not share these but will tell yu the general category has to do with the Green Bay Packers. 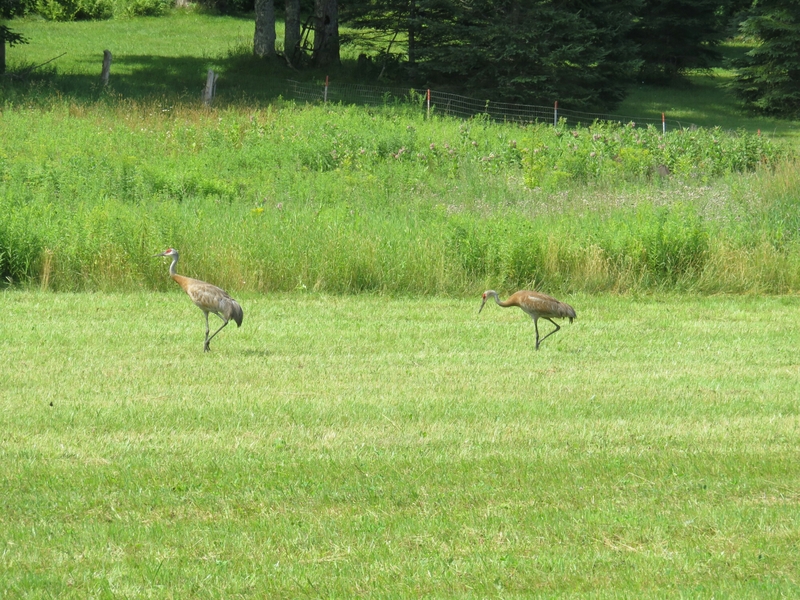 Peter identified these birds we’ve been seeing as Sandhill Cranes. I knew them to be a migratory bird that comes through parts of Wyoming, but I’d not seen one before. 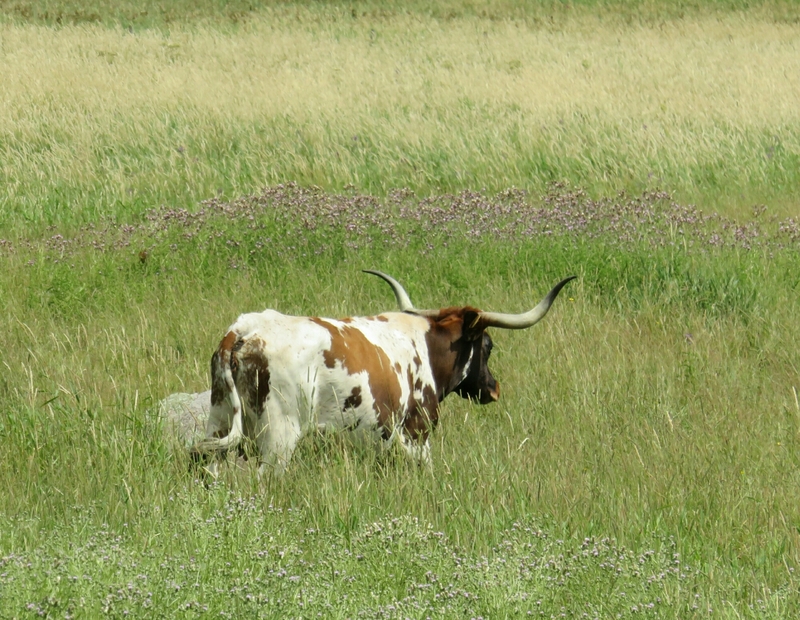 We encountered this fellow as we were riding along County Road FF. 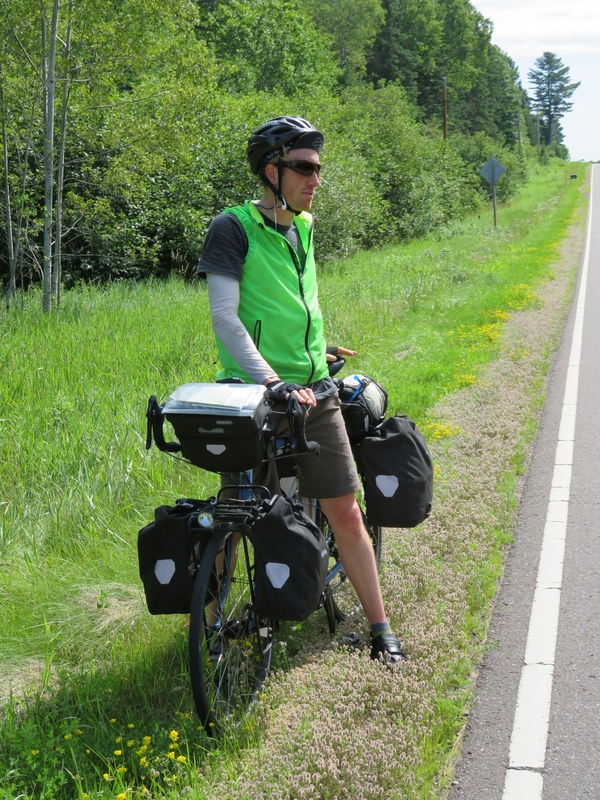 Pete is west bound and has been on the road from Bar Harbor for 27 days. He’s running about 75 miles a day solo headed to Anacortes. Peter rode a total of 75 miles that day, the second half of the ride was into the wind. A most impressive showing from a genuinely warm and impresssive fellow. Thank you Peter and we’ll see you on the Island in December! 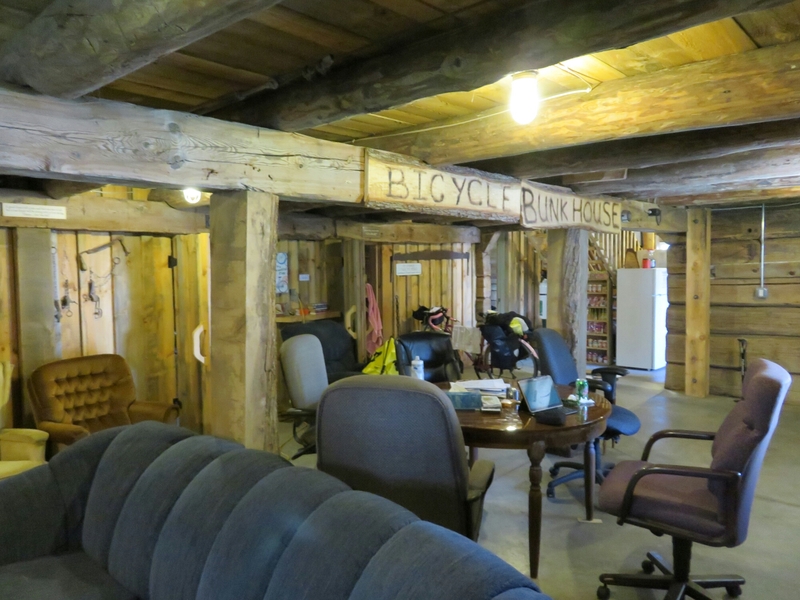 The last night in Dalbo, we shared space in the Bunkhouse with a father and daghter team, Norm and Amy. They are from Michigan and North Carolina, respectively. 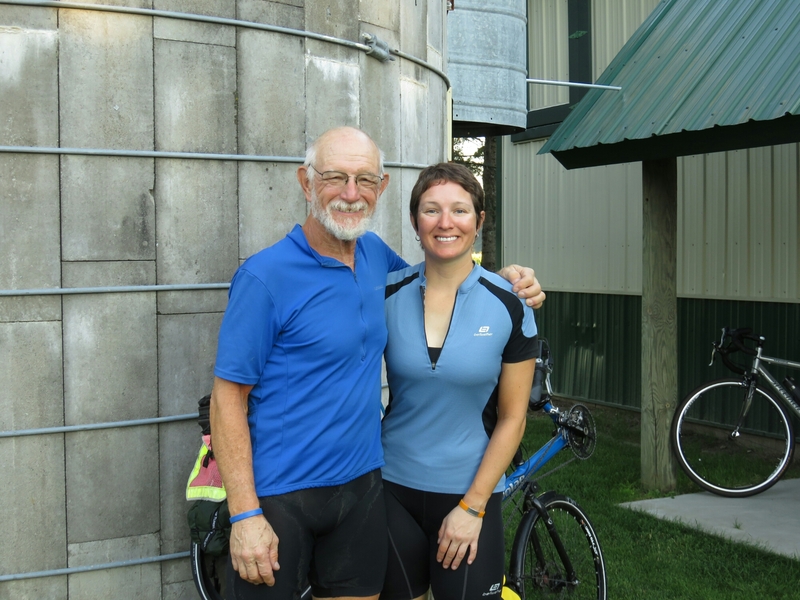 The two are on the Northern Tier headed for Bar Harbor with some deadlines involved, so they are averaging about 70 miles per day. 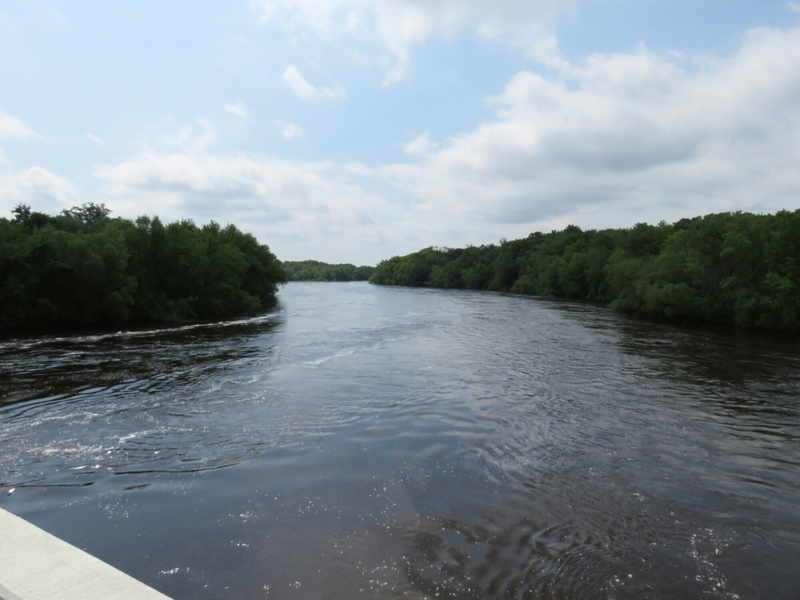 Meanwhile, after pushing out of Dalbo, we entered Wisconsin crossing the St. Croix River near St. Croix Falls. 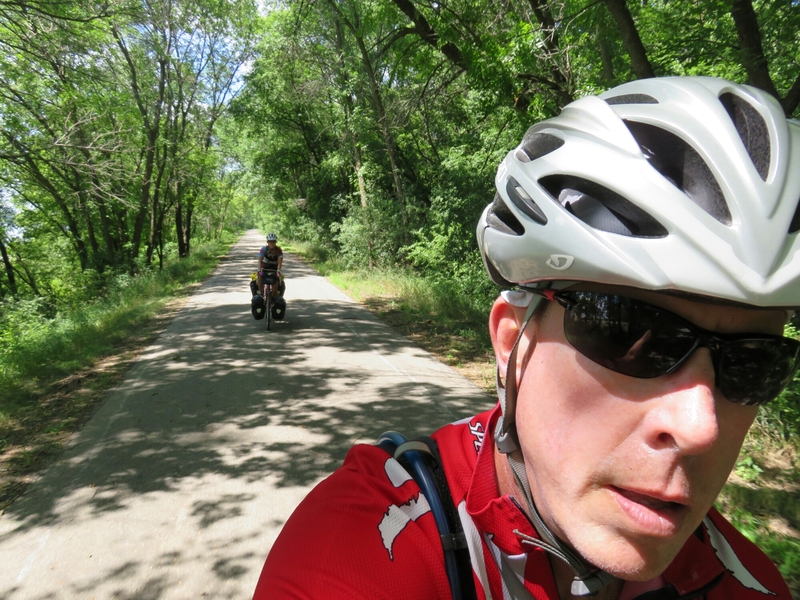 Unlike Minnesota’s hundreds of miles of trails, we rode the Gandy Dancer Trail for about six miles or so ONLY after paying a user fee of $5 per bicycle. The good news is I can never be accused of not paying taxes to ride my bike ever again. I have the receipt. 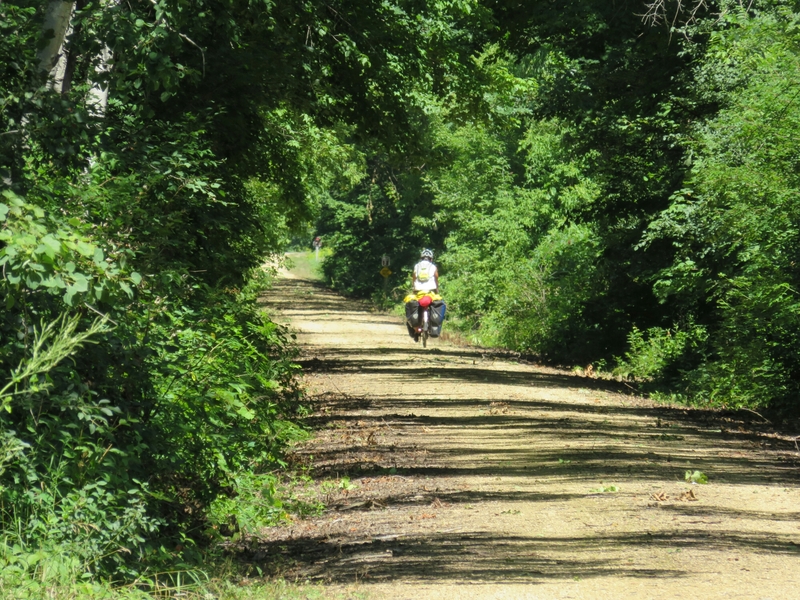 Sallie on the Gandy Dancer Trail. $5 and it's not even paved. Finally, we capped off our night at a campground near Bunyan, WI where we went to the campground’s tavern to get some dinner. The place was packed to the rafters with folks engaged in a meat raffle. That was a first for me. We had pizza and watched large sums of money exchange hands for everybody in the place to take chances to win packages of meat that seemed to be procured from a local grocery. The next day turned out to be a short one as we got into Cumberland after only about 25 miles and the locals were cautioning us about proceeding on as a storm was coming that was getting severe warnings. We holed up in Cumberland for the day and we’ll hit it again tomorrow. By the way, this storm is supposed to flush out the hot humid weather the area has been getting. That’s good because I don’t think these snow machine and ice fishing Packer fans around here go for that stuff. 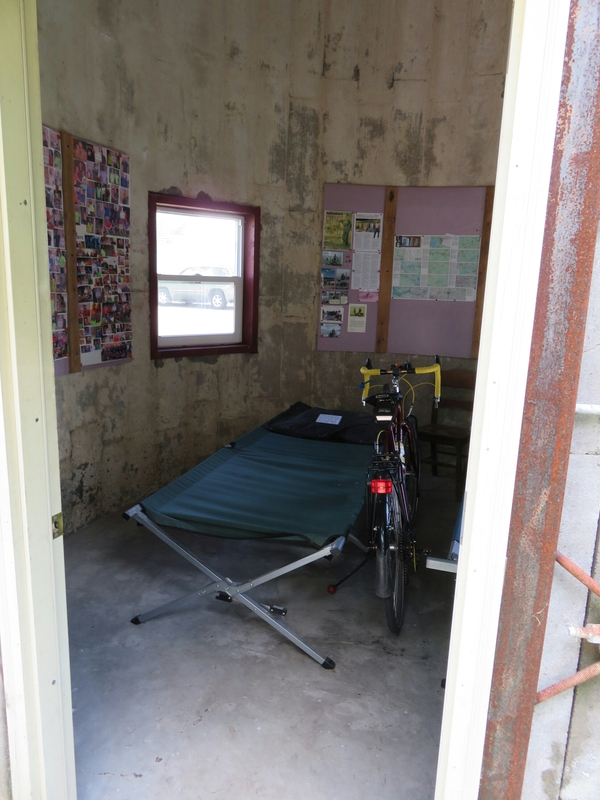 There are some places in the country where citizens realize they are on one of the Adventure Cycling routes and they take an action to accommodate cyclists. Sometimes these efforts are on a pretty grand scale. Let me show you around one of these efforts by first introducing you to Donn Olson. Donn is a retired Chief Warrant Officer (CW05) of the U.S. Army with 30 years in service spanning the Vietnam War forward. 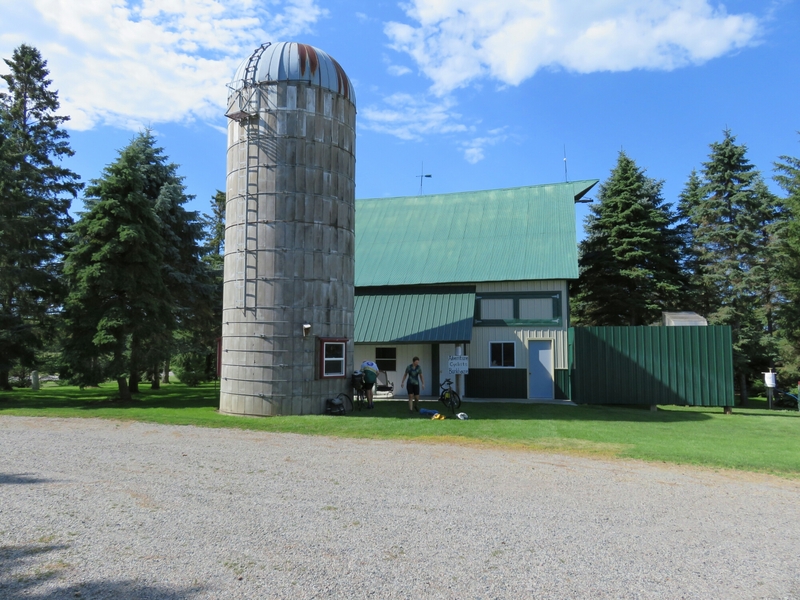 Donn has a farm just outside of Dalbo, Minnesota and noting the number of cyclists coming down the small county road where he lives, he decided to do something to help, and help he did. 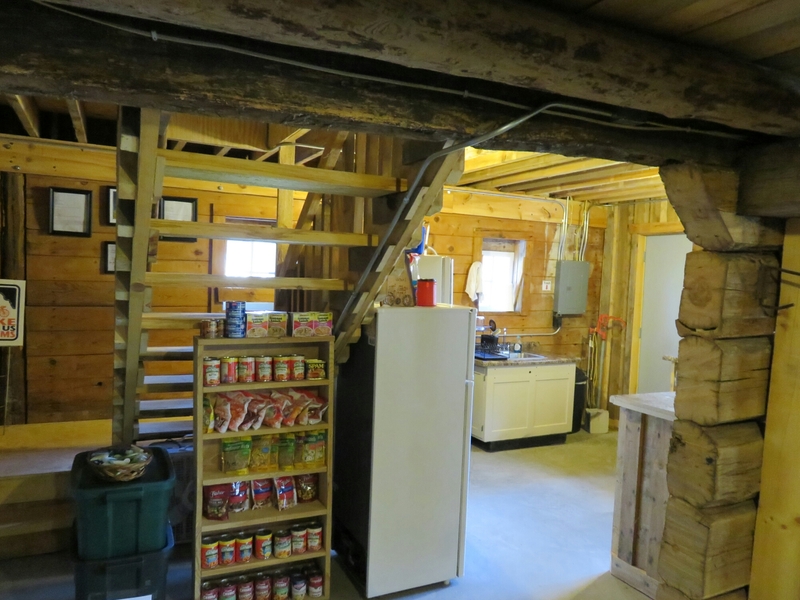 A loft in the second story…. 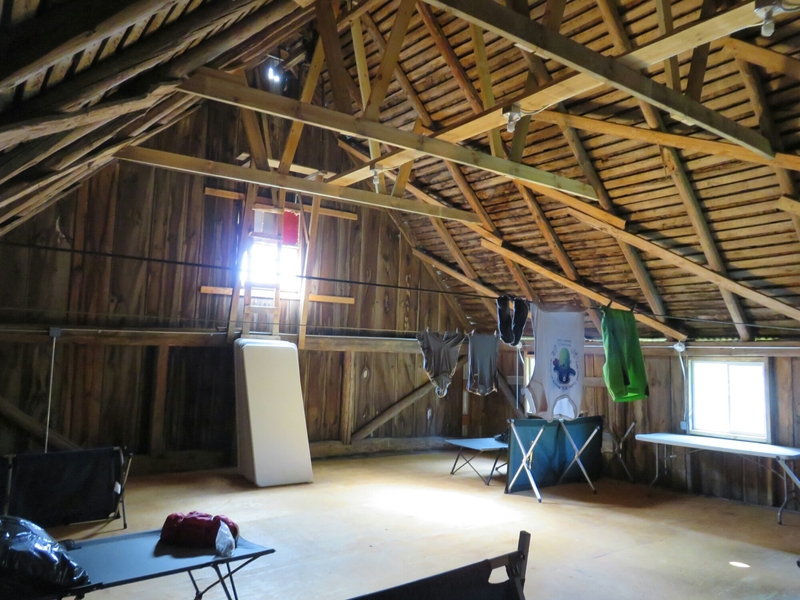 And extra sleeping quarters in the silo and up in the loft if needed. 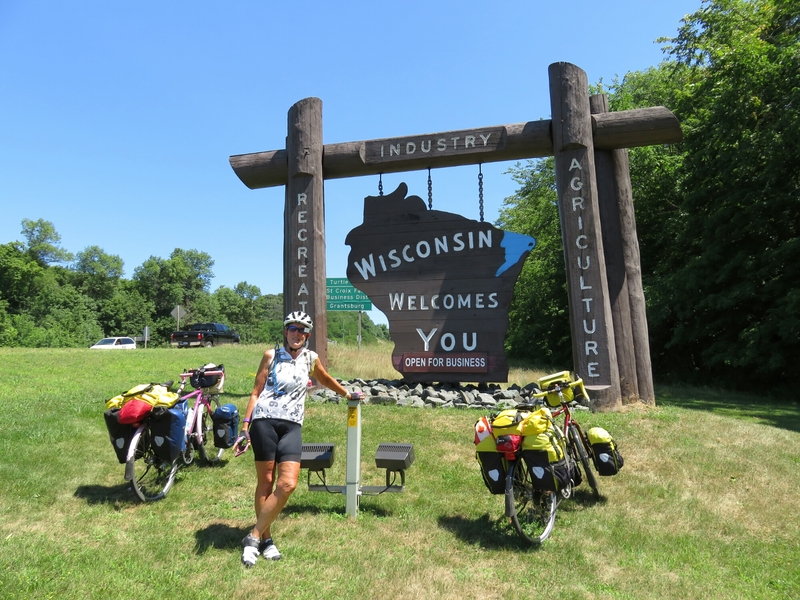 We cycled 92 miles on the 20th to get to Donn’s place on July 20th. There had been severe heat and humidity warnings for the last few days as heat index ratings were well over 100 degrees. The locals were very uncomfortable but Sallie and I were pretty much in our element. We were told by the Teachers this was a “do not miss” spot to stop, so we pressed on through the heat to find the air conditioning working just fine, but a little cold for our tastes. 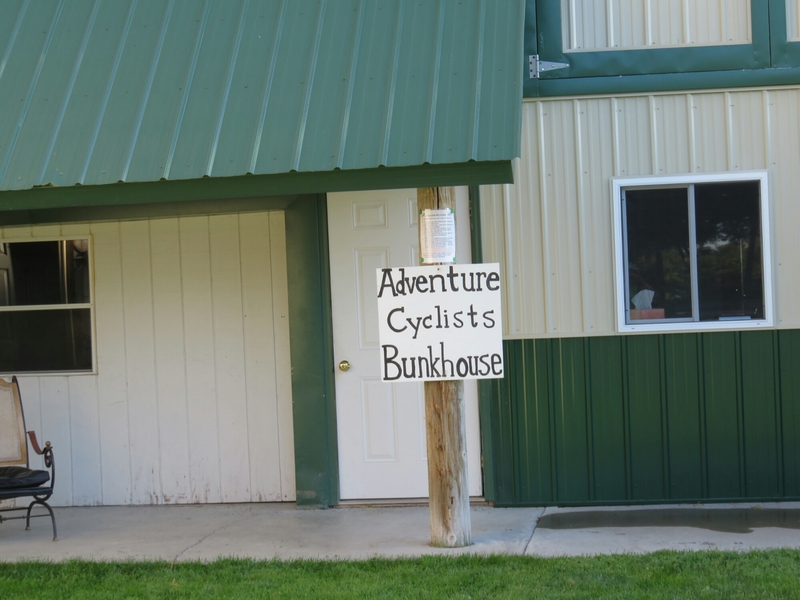 Donn’s Bicycle Bunkhouse has won several awards and is written up frequently in cycling magazines. He’s a wonderful fellow, very generous and helpful. He keeps track of his cyclists and we logged in as the 85th and 86th cyclists stopping this year so far. 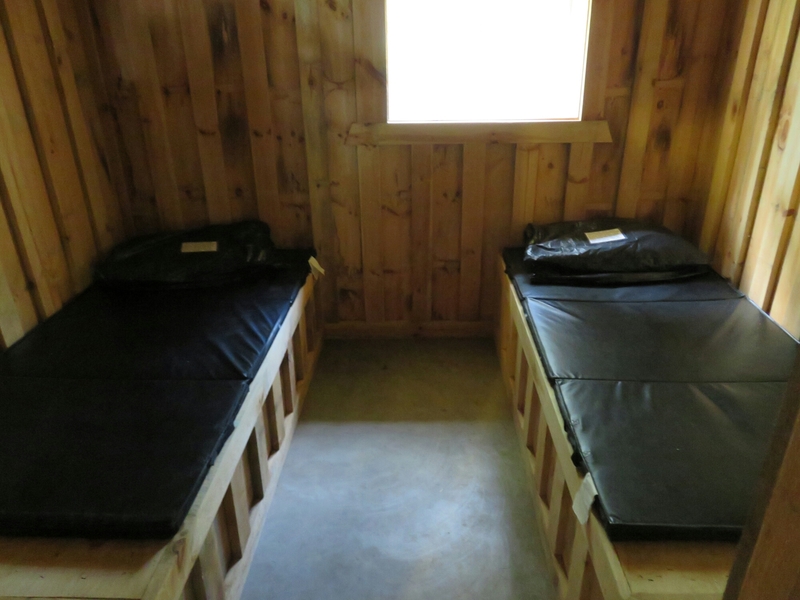 As it turned out, a completely unpredicted and violent thunderstorm came up that night at about 3:00am, followed by another the next morning. 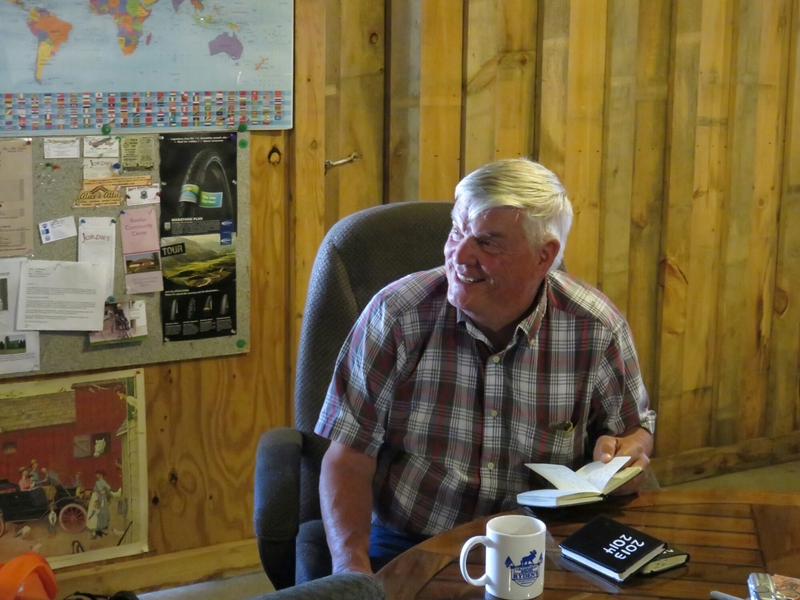 We chose to remain at the Bunkhouse for another day until the weather cleared out and enjoyed Donn’s company, his stories, and the wonderful welcome. On our way to Fargo, the six of us stopped for “second breakfast” at the Morning Glory Cafe in Kindred, North Dakota. A fellow introduced himself to us as Ron, and expressed his admiration for the cyclists he often encounters as they come through. When he was younger he worked in a bike shop in Seattle and rode every day. It was easy to tell he was quite nostalgic in his recall of his story. Upon asking for our checks, we found out Ron had picked up the tab for us. 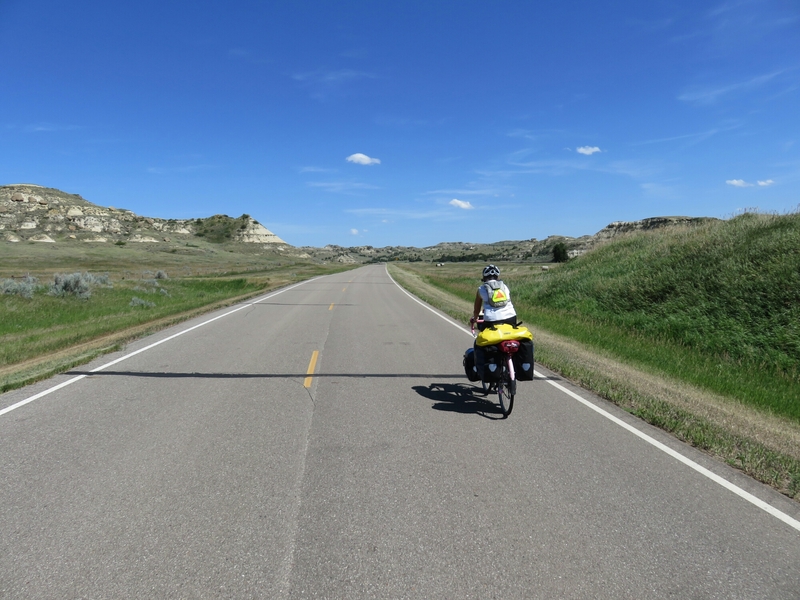 Fargo is on the eastern end of North Dakota and represents an end to what most cyclists refer to as the “worst” part of the ride on the Northern Tier. I can’t say I disliked riding through North Dakota. It wasn’t the most scenic state in a conventional sense, but on a bicycle there is always plenty to become familiar with if you look. These little lake are referred to as "pot holes". They are all over eastern ND. They are not spring-fed, they just collect rain and snow. 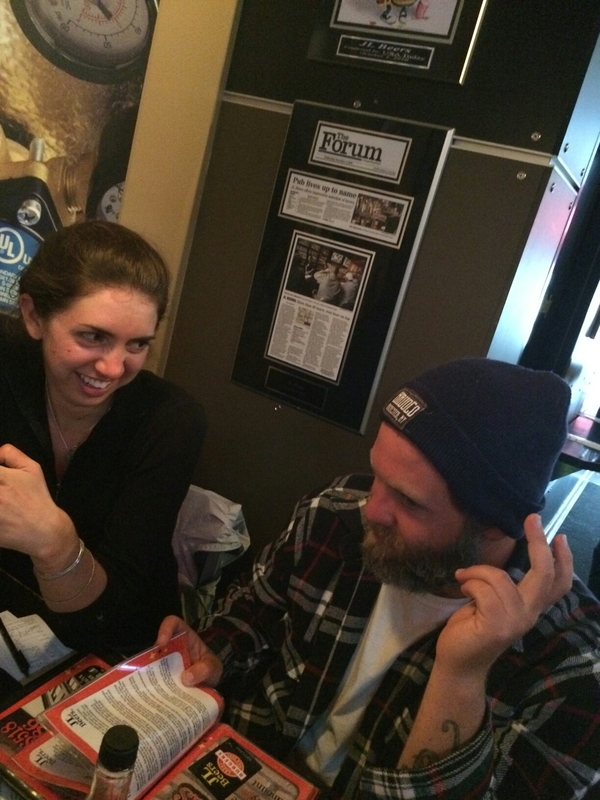 On arrival in Fargo the Teachers separated to visit a relative of Meg’s. Sallie and I picked up her new tent at the post office, I needed some items from the bike shop, and we were in need of some bungee cords. We had not taken a day off in 22 days since Sallie’s birthday on June 24, so we decided to shut it down for a day and maybe take in the street festival taking place on Broadway Street. As it turned out, it was our good fortune to meet up once again with Ryan Conaughty and make the acquaintance of Jenny, a Northern Tier rider we’d heard about for some time coming up behind us. 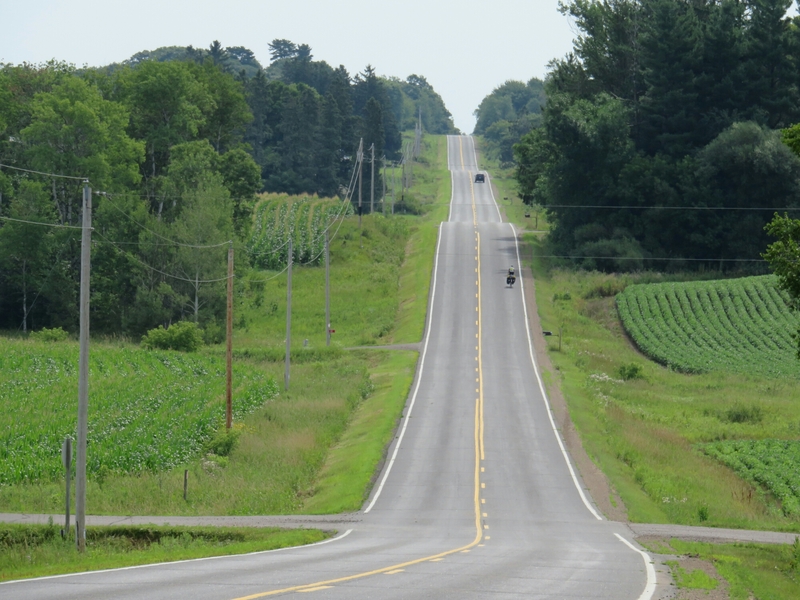 We entered Minnesota on July 17 and soon were greeted with roads that had actual curves and rolling hills. That was quite a change for us as we’ve had roughly 1,000 miles each of mountains followed by farm land. 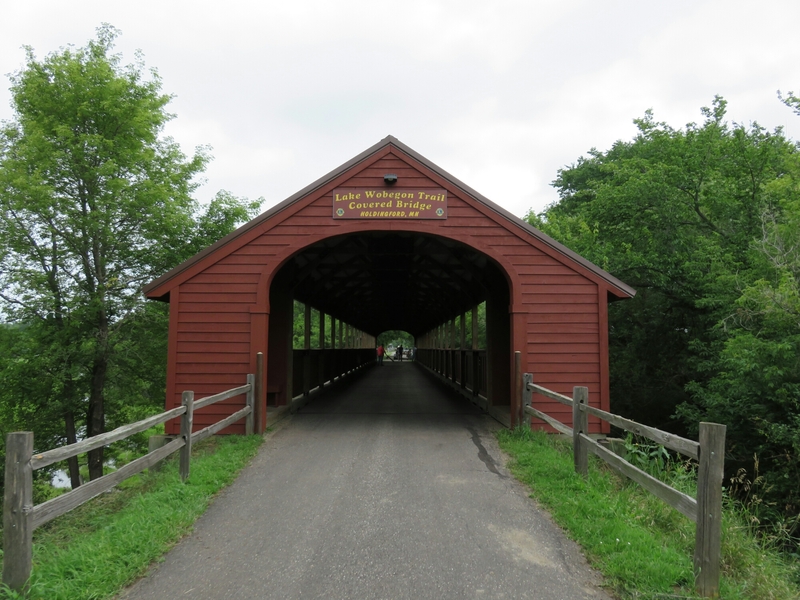 The route we take in Minnesota has over a hundred miles of rail-to-trail that is part of several hundred miles reserved for this purpose going through the Central Lakes area. All of these are paved with asphalt and I’d like to think this was all designed for bicyclists and hikers, however if you pay attention to the signage, it’s obvious these serve a dual purpose as snowmachine trails in the winter. Nonetheless, this is a great asset for the state of Minnesota. 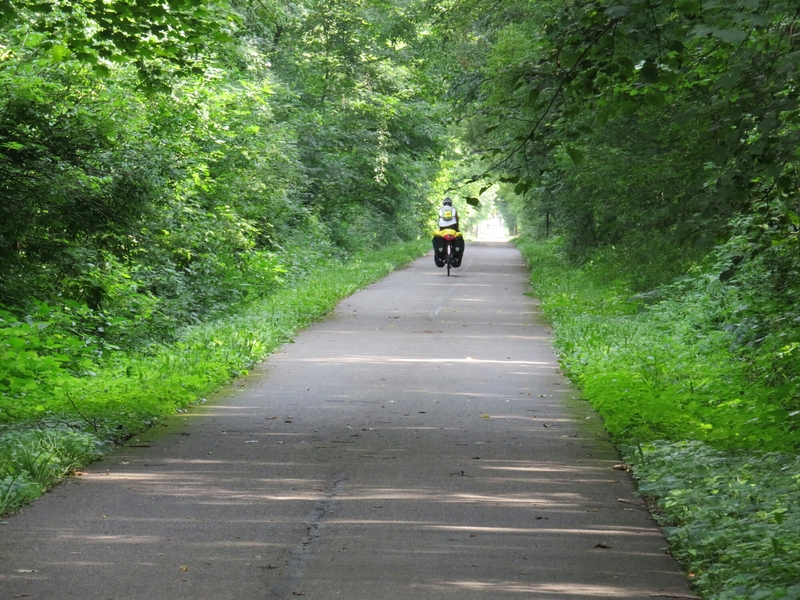 They even have a stretch we rode designated as “Lake Wobegon Trail”. 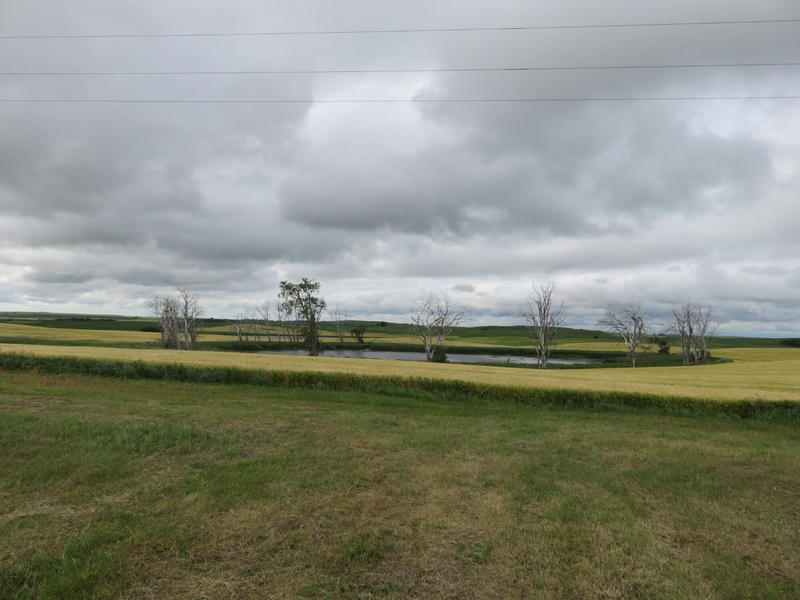 No, Lake Wobegon is not on that trail – sorry – keep looking. We also crossed the Mississippi River while entering the eastern portion of Minnesota. That’s always an event in crossing the country. While the mighty Mississippi is not that wide this far north, the river is up a little right now as the week before some areas here got 10 inches of rain or more. 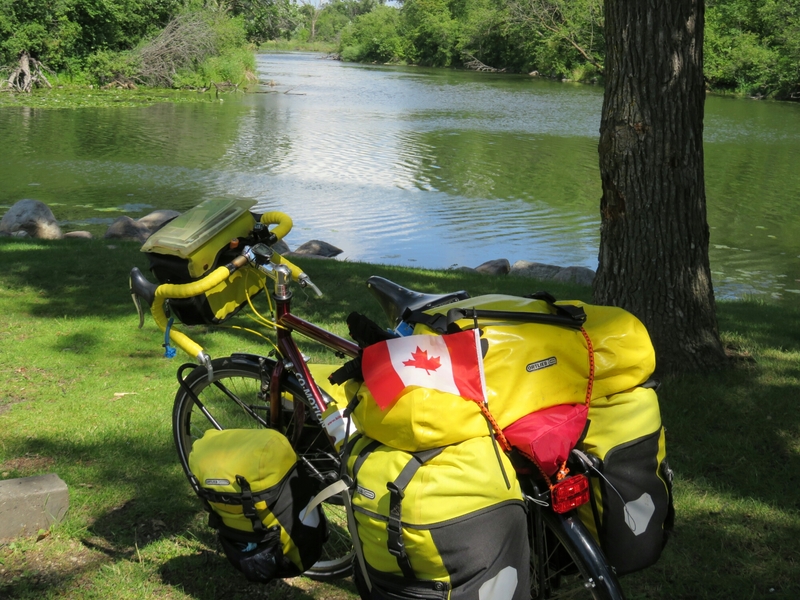 As readers can tell from my journals, we encounter a number of folks on these rides and I try to make note of them, even if it might be a brief passing of a touring cyclist going in the opposite direction. We’ve seen groups that work well together and we’ve seen groups absolutely disintegrate in front of us. We know of solo travelers that do not deal well with the loneliness of their experience and they quit their dream to complete their trip. I’ve often thought that folks we encounter that struggle with the ride or, more often – each other – have difficulty because of mixed goals. Over and over again it seems this gets demonstrated. If one person wants to take short-cuts, or another wants to get more miles in every day than another, that’s just not a good mix. Touring is not easy. While it is not an athletic contest, it is quite taxing both physically and psychologically. As noted, the calorie intake requirements are great, rest is essential, and while the human body is incredible at making adjustments to the stress of touring, our societal “filters” get challenged and may (in my case, will) run thin. The group we refer to as “the Teachers” is a mix of three that are as solid as can be in this trying environment. They’ve adapted extremely well to the conditions, they have closely matched goals, they’ve worked out their schedules accomodating everyone in their group, and most importantly they maintain a terrific sense of humor about everything they do. Oh…and they are powerful, competent cyclists too. All this and they work together professionally too. 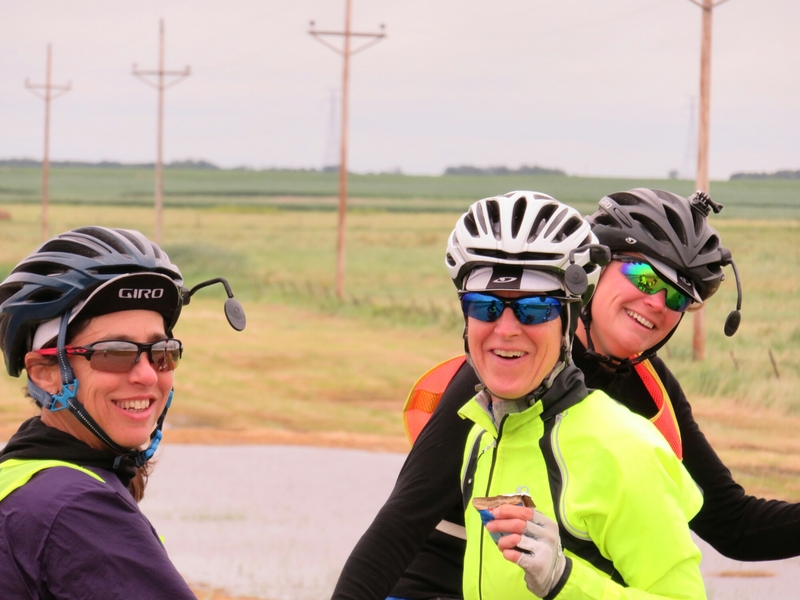 On July 15 as we were headed into Fargo, Sallie and I left the group after “second breakfast” and each turn in the road, I looked in my mirror expecting them to see them as they overtake us. I’d look on the long stretches too and they were no longer in view. It was a powerful reminder of the influence some people can have in our lives. It had only been a short while, but their absence was felt. Sallie and I are very shortly going nothwards on the “North Lakes Bicycle Route” as the Teachers continue on the normal Northern Tier so our chances of encountering these wonderful women are now nill – at least in this context. Godspeed ladies. In this and all you do. By the way, I have a job idea for the border patrol officer that says I can’t display this flag. I know a tree service company in Idaho he can go to work for. He’d fit right in.